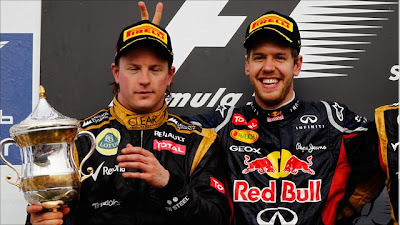 World champion Sebastian Vettel took his first victory of 2012 in a close battle with Lotus's Kimi Raikkonen at the Bahrain Grand Prix. The Red Bull driver built an early lead from pole but was caught by the Finn, who started 11th, after half distance. Vettel then pulled away after the final pit stops, despite Raikkonen's attempts to close him down. 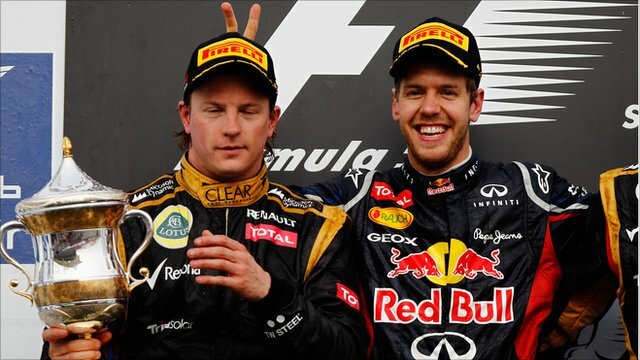 Lotus's Romain Grosjean was third, with McLaren's Lewis Hamilton finishing eighth and Jenson Button retiring. Force India's Paul di Resta, doing a two-stop strategy in contrast to the three employed by the rest of the main contenders, drove an excellent, studied race to take sixth place. The Scot was running fifth going into the final 10 laps but was helpless to defend from Mercedes driver Nico Rosberg, who was on fresher tyres in the closing laps. Di Resta seemed poised to lose a further place to Button, but the Briton's McLaren suffered a puncture with three laps to go and dropped out of the points, before retiring on the penultimate lap with a broken exhaust. The Scot also just managed to hold off a challenge from Ferrari's Fernando Alonso in the closing laps. Rosberg was investigated for possible dangerous driving in defending from both Hamilton and Alonso earlier in the race, but was cleared of any wrongdoing by the stewards.